Have you ever found a fascinating article on the Internet but lacked the time to read it on your Surface immediately? That’s where the Reading List app comes into play. 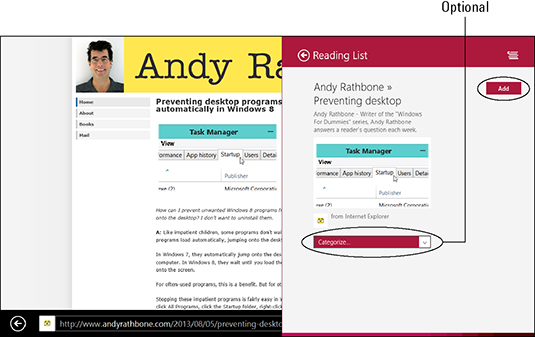 Built into Windows 8.1, the Reading List app lets you dump those articles into a handy storage space where you can easily find and read them later. 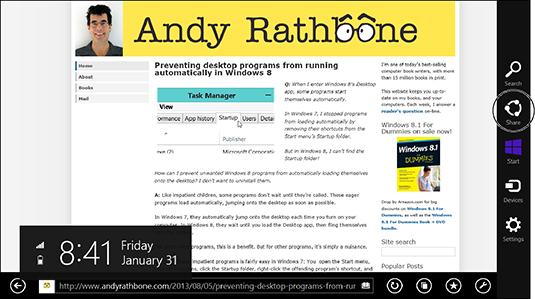 Reading lists you create with the app remain synced with your Microsoft account. Every time you sign into a Windows 8.1 PC, Surface tablet, or Windows phone with your Microsoft account, your Reading List will contain all of your added pages. 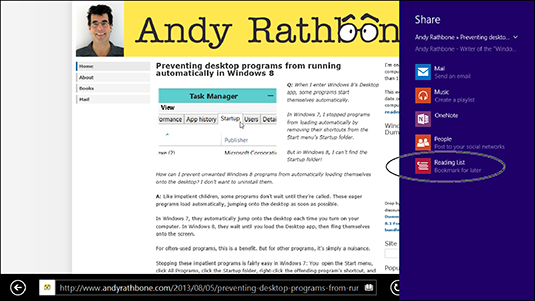 The Reading List works with the Start screen’s version of Internet Explorer; you can’t add pages to it from the desktop’s version of Internet Explorer. From Internet Explorer, slide your finger inward from the screen’s right edge to summon the Charms bar. Then tap the Share icon. When the Share pane appears, tap Reading List. The Reading List app appears along the screen’s right edge, showing a preview of your content. If desired, choose a category for the material by tapping the Categorize drop-down list and choosing an existing category or choosing a new category. Then tap Add. Your saved page will appear in your Reading List app under either the Today category or your chosen category. To read your saved material, open the Reading App from the Start screen. The Reading List app lists your saved pages, sorted by either your chosen category or the date you added them to the list. Tap any article’s thumbnail, and the Reading List app displays it onscreen.